Susan is a member of the Word Wenches. Check out their blog below. Watch the book trailer for Queen Hereafter. Cast by fate into the treacherous courts of 11th-century Scotland, a young princess seeks sanctuary . . . and discovers her destiny . . .
Also available in trade paperback and ebook! A warrior princess defends against an ambitious warlord in 11th century Scotland . . . whose claim to the throne needs the one woman whose blood is more royal than his own . 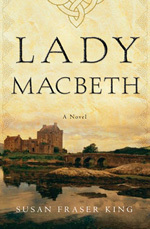 . .
Watch the book trailers for Queen Hereafter and Lady Macbeth! Visit my Facebook page and visit the Word Wenches blog! Margaret, a young Saxon princess, is shipwrecked with her family on the coast of Scotland and forced to accept sanctuary from the recently widowed warrior-king Malcolm Canmore of Scotland. Malcolm sees a political prize in Margaret, and promises to help her brother, the outlawed rebel Edgar of England, in return for his sister’s hand in marriage. When Malcolm brings a female bard, Eva, to court as a hostage to ensure good behavior of her kinswoman, his conniving enemy Lady Macbeth, Margaret, and Eva expect to resent one another. Instead, they discover an unlikely bond as outcasts of a sort–Eva a wild Celtic spirit captive among her enemies, Margaret suppressing her passions as she endures increasing pressure as a queen and a mother of princes. Torn between loyalties, Eva must betray the king and the new queen in order to honor her devotion to the former queen. 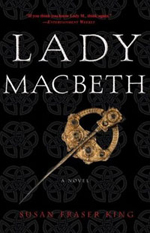 Thrown into Malcolm’s dungeon, charged with witchcraft and treason, Eva soon learns that Queen Margaret–counseled by the furious king and his powerful priests–will decide the fate of the young bard and her mentor, the troublesome Lady Macbeth. 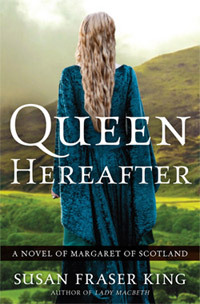 Queen Hereafter chronicles the life of little-known Margaret of Scotland, a contemporary of the infamous Lady Macbeth, and a woman destined for sainthood. “Through a combination of assured scholarship and powerful storytelling, Susan Fraser King brings alive the complex, vivid world of Margaret of Scotland. With vibrant characters and lyrical description, this is a wonderful evocation of eleventh century Britain in all its fierce splendor." "Powerful and lyrically written, Queen Hereafter illuminates a little known corner of Scottish history with riveting authenticity. Susan Fraser King weaves together the threads of women's lives into a tapestry of love, friendship, and the eternal search for truth." 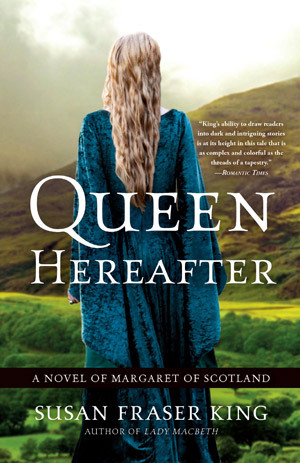 "Susan Fraser King’s books, Lady Macbeth and now Queen Hereafter, are such delights--she lets us explore where normally we historians are not permitted to go. And what a wonderful pleasure that is, for she brings the scholar’s eye for authentic detail and evokes all the smoky atmosphere of medieval Scotland. Oh, I am jealous—and grateful."